Visit participating IHOP locations TODAY, March 12th to celebrate IHOP’s Free Pancake Day and help kids treated at East Tennessee Children’s Hospital. 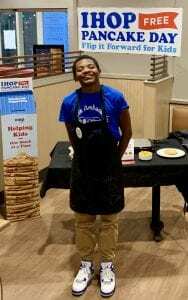 Visit a participating IHOP location on March 12th and donate to your local Children’s Miracle Network Hospital in exchange for a free short stack of pancakes. Try Kid Chef Brody’s OREO® Oh My Goodness pancake that is featured as a limited-time special on the IHOP menu through April 14, with $1 of each purchase benefiting Children’s Miracle Network Hospitals (depending on location). You might think it’s just a day to get a free short stack of delicious IHOP buttermilk pancakes, but it is actually a day that makes a BIG difference for kids treated at our hospital. Kids like Bryan Cody. Bryan has been a part of our East Tennessee Children’s Hospital family since he was 6 weeks old and his mother, Trista, received a phone call diagnosing Bryan with sickle cell anemia. Sickle cell anemia is a condition in which red blood cells are not shaped like the round discs they should be, but more like sickles or crescent moons. Due to their shape they get stuck together and block small blood vessels, which can lead to pain and organ damage. Bryan has been in and out of the hospital for pain crisis and sometimes requiring blood transfusions since he was an infant. He has been hospitalized over 80+ times in his 14 years. Bryan is in a constant battle with sickle cell, but he is resilient and has a smile that can brighten anyone’s day. Donations raised during IHOP Free Pancake Day from the following locations will go directly to East Tennessee Children’s Hospital and help provide needed pediatric medical equipment to patients like Bryan.